The temperature here is a sticky 35C and the backdrop is rubber plantations. Welcome to Moscow. Moscow, Kerala, that is - a village in the southern Indian state given its name by local communists, inspired by Soviet Russia. Lenin, Stalin, Brezhnev and Khrushchev recently gathered here along with Natasha, Tereshkova and Anastasya. Gorbachev failed to show. In fact, there are six Lenins, two Gagarins and two Pushkins - Indians given Russian names, meeting here to chew the fat on the personalities after whom they were named. There is a lot of excitement in this rubber growing belt as a van carrying the "personalities" reaches Moscow. One Lenin, 25, has studied law and is now doing his masters in social work. His parents are staunch communist supporters. "I am proud to have this name. I have travelled to different parts of India and never come across another Lenin," he says. Until now. Lenin's parents are staunch communists and their enthusiasm for communism saw them name their son after the Bolshevik leader. Schoolteacher, Gagarin, 45, says he was named after the first man in space, Yuri Gagarin, because he was born in the same year as the historic voyage. Gagarin says his name inspired him to a keen interest in astronomy. More than 30 people from Kerala assembled at the meeting organised by Trivandrum's Russian Cultural Centre. Ratheesh Nair, the director, says he decided to organise the meeting when his friends told him about the village called Moscow. Young Tereshkova studies in grade seven and is proud of her name. One of the two Pushkins had little idea about the Russian author after whom he was named. He seems a little lost when asked to speak to the gathering. But, the second Pushkin, a bank employee, was up to date with information about the Russian writer. VG Pushkin says that as a child he was embarrassed by his name. "It was only later that I realised the importance of having such a name," he says. "None of the 25,000 in my bank has a non-Indian name. I am well known because of this name." 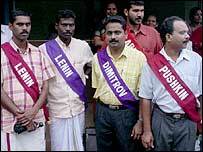 Kerala is one of two Indian states with considerable backing for communist parties. It was the first Indian state to elect a communist government, in the 1950s. The worldwide surge of communism saw many in India seek inspiration from Russian leaders. 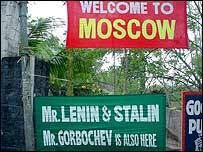 It was then that this tiny village in Kottayam district saw its name changed to Moscow. Most of the people with Russian names were born in the Cold War decades. But one of them, local bus driver Khrushchev, says he has given his own children Indian names. "My wife does not like such names and she is a staunch believer in Lord Krishna. She persuaded me to give my daughters and son typical Kerala names," he said. Pushkin also gave Indian names to his daughters. "I feel ashamed of not showing enough courage like my father. My daughters are called Lakshmi and Reshma," he says. The fascination for naming children after Russian leaders has declined since the collapse of the Soviet state. Many still name their sons after Lenin but Brezhnevs, Stalins and Khrushchevs have become a rarity.